The Gardenmakers is an award-winning company that has been building and designing projects since 1980. The company ethos entails meeting client needs and striving for excellence and innovation in all projects. With over 35 years of experience, The Gardenmakers services range from sensitive environmental works and public spaces, to sub-divisions, multi-housing developments, schools and playgrounds. Operations are conducted under an accredited WHS system and environmental compliance. The Gardenmakers has a broad range of landscape capabilities and a record of delivering both quality and value to their clients. They maintain skilled estimators, managers, designers and site staff capable of delivering on time and on budget. 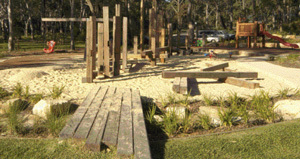 The company also offers a complete playground design and/or build service including safety audits.